we raised $150,000+ for our amazing school! THANK YOU to everyone who donated their time and talents -- without all of you, this would not have been possible. And to all the ITS families and extended community who contributed financially -- from the family who gave the $10,000 boost when we hit 100 sustaining donors, to those that dropped off their dollar on Dollar Day or to the families that clipped Box Tops with their kid/s -- every last one of you helped us soar past our goal. 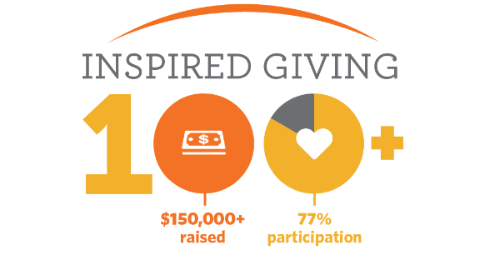 77% of our families participated in Inspired Giving this year -- that's extraordinary! We also want to acknowledge the remarkable number of ITS staff who donated -- we all know how much of themselves they already give and they continue to go above and beyond what anyone could expect. And, to the many businesses who donated to our online and live auctions and provided in-kind donations and sponsorship gifts -- we THANK YOU too! Inspired Giving is the name of the Inspired Teaching School’s Annual Fund. It is comprised of fundraising efforts which go directly to the Inspired Teaching Demonstration Public Charter School. The goal is to raise and provide unrestricted funds to expand resources and opportunities in and out of the classroom well beyond the limits of the budget we receive from the District. Money raised during the 2016-2017 school year will be spent the following year. ITS leadership determines fund allocation. Last year's Inspired Giving funds are helping to add increasing salaries (increased compensation and salary pool for all staff), provide transportation for field trips, books for the classrooms, a sun shade for the playground, professional development resources for the teachers and part of the establishment of the library and media left. DO YOU KNOW YOU CAN DONATE ANYTIME? ITS accepts donations all year through our established Razoo page. Please visit: https://www.razoo.com/story/Inspiredteachingschool to contribute today!